Stacia the Radio Producer (or the Cumulative, Collaborative Nature of Success). I’ve been waiting awhile to be able to announce this, but today I get to let you all know that for the next nine months (and hopefully beyond! ), I’m going to be producing a radio show/podcast with Morgan State University’s radio station, WEAA FM 88.9, as part of AIR/Localore’s Finding America project. This month marks one year since I left my last full-time contract job and began to work as a freelance writer. A year was my self-imposed deadline. I knew freelance writing life, and I didn’t want that work to be my primary source of income any longer than was necessary. So I spent the entire year applying to full-time work, fellowships, residencies — anything I felt capable of doing well, anything that might lead to job security (such as that still exists). I went on a lot of interviews — mostly for editing and writing positions — and I enjoyed a great deal of learning opportunity this year. But nothing had resulted in full-time work. As I frequently disclose in my writing, as a parent, having full-time income is paramount — but so is being present for my daughter. I was pressuring myself to get an office job, because I thought that was the only way to feel financially secure and less panicked about the future, but I was also wary about the prospect, as I knew I’d be away from home far more than I wanted to be. I’ve been writing a lot for some incredible publications. But over the course of this gap year, no full-time employment had materialized. As an artist, as someone who excels at just one art form/medium, making a living can be complex. It’s a lifelong riddle, really. I’m an English major with an MFA in creative writing who has been an online newsletter editor, a freelance writer, a weekly columnist, an adjunct instructor at four colleges, a community engagement fellow, an online community founder, a writing coach, a test curriculum writer, and a few other odds-and-ends position-fillers I can’t quite recall at the moment. I’ve always thought that I was my best self as a writer — and I still think that’s true. For every job I’ve ever done, I’ve drawn on my ability, experience, and intuition as a writer. It’s the only thing that all my positions have in common. I remind myself of this when I feel like a bit of a flake, transitioning from career to career and never finding solid enough footing. The desire either to create narratives or help others create them permeates everything I pursue — and, as through-lines go, I believe that’s a good one. In June, I applied for AIR’s Localore/Finding America project with that in mind. I had just returned from Thread at Yale, where I’d learned a lot about how to approach precisely this kind of storytelling. One of our lecturers there was Glynn Washington of Snap Judgment. Another was Catherine Burns, Artistic Director of The Moth. And my roommate during the conference, by fate, serendipity, and/or unearthly grace, was Nicole Taylor, creator of her own long-running podcast, Hot Grease. At the time, I was awestruck by all the audio storytellers’ origin stories (this kind of work lends itself well to mid-career transition), and Nicole had encouraged me to consider getting into podcasting. But it felt sort of beyond me, even as my interest in it spiked. About three weeks after Thread, when I got an email encouraging me to apply for Localore/Finding America, it felt fairly auspicious. 2015 has been a year of big leaps for me, so taking one more seemed like a no-brainer. When I apply for lofty, dreamlike opportunities, I do so without expectation. I tell myself, “I probably won’t get this,” and if/when I do, I worry about how to make it happen afterward. It’s the only way I can bring myself to go after gargantuan things, things that make my heart rate quicken and my knees buckle. I found out I was a finalist in August. I found out I was part of one of the 13 teams selected in September. And now I get to tell you all about it. 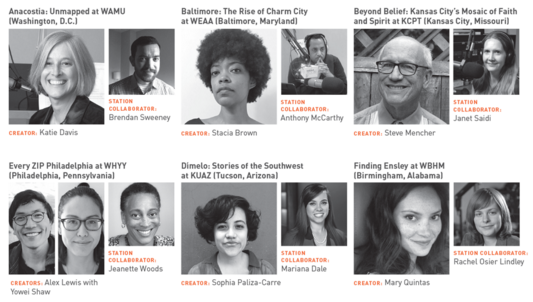 Our project is called “Baltimore: The Rise of Charm City,” and it’ll be a biweekly half-hour radio show/podcast, airing on WEAA and available for online download. It’s an intergenerational project: one elder and one young person, or one family with generations steeped in a single Baltimore City neighborhood. We’ll ask them about places they’ve been and things they’ve experienced in this city, in order to draw connections between life in Baltimore decades ago and life here now. Baltimore is a city with a history of rising from ashes. With this show, we want to explore what that looks like on a personal level. And it’s also a place with innumerable charms, often secreted away or lost amid media coverage of its harrowing challenges. The nickname “Charm City” was coined in 1975 by ad execs and creative directors, under the hire of then-mayor William Donald Schaefer, who wanted to rehab Baltimore’s public image. There have been other nicknames and campaigns, The City That Reads and Baltimore: Believe among them. But Charm City is due for a real revival — and the biggest charms Baltimore has to offer are in the stories and personal histories of and relationships between its people. We hope to capture both concepts: the resilience and the charm. Our first episode will air in January 2016, so I’ll be promoting it more here and via social media and an as-yet-launched website/blog before the end of the year. Localore/Finding America ends in July, and we should produce 12 episodes between January and then. But “Baltimore: The Rise of Charm City” isn’t just about producing a radio show. It’s also about building stronger relationships between the people of Baltimore and the institutions that exist because of them. WEAA’s slogan is, “The Voice of the Community,” and we want this project to reinforce that in as many creative way as possible. So we’ll be visiting community meeting spaces to tell people all about this program and to and to encourage them to interact with us by answering fun storytelling prompts, Vine/Instagram videoing themselves for our website and following us on social media. We’ll also have a few larger-scale live events during the project’s duration. I’m very excited about it, for myriad personal reasons. Chief among them: I’m developing an entirely new skill set. By the end of this, I’ll be able to do something that requires much more of me than a lot of my previous work has, especially in terms of performing introversion and being present for others. But I’ve been building toward it. Brick by brick, but unbeknown, I’ve been becoming someone capable of this. This project allows me to marry my desire to serve, my ability to write, and my passion for compelling people to give something of themselves to the world through their own stories. In order for it to thrive, I have to expand the borders I’ve set for myself — only so much of me goes out, and only for a set time, and only under specific conditions — and become something… more. I’ll need to believe I’m capable of doing that (and I cannot begin to explain how difficult that will be for me). And I’ll need to accept that this life — one where work isn’t always stable, but art is — is my life. It doesn’t look like other thirtysomethings’ lives. It’s a little (or very, depending on which one of my loved ones is assessing it) unconventional, but I’m so fortunate to be living it, just this way, with so much support from so many people. There’s nothing that can replace people believing in you and your ability to excel at things you’ve never tried — things that genuinely terrify you. And when we announced this project at noon today, I received so, so many messages of excitement, affirmation and expectation that I feel both pressure to succeed and confidence that I can. I am a person who draws on a great cloud of witnesses for that kind of motivation. If you’ve tweeted, emailed, texted, or messaged me at any point during my professional life, you can claim part of this and my previous successes. You really can, and I cannot thank you all enough. With great humility and gratitude, we proceed.